"The future of nation depends on the worth, capabilities and motivation of today's youths. The future is neither unseen nor unknown. It is what we make of it. What work we do with our two hands today will shape the future of the nation." ~ His Majesty Jigme Khesar Namgyal Wangchuck. 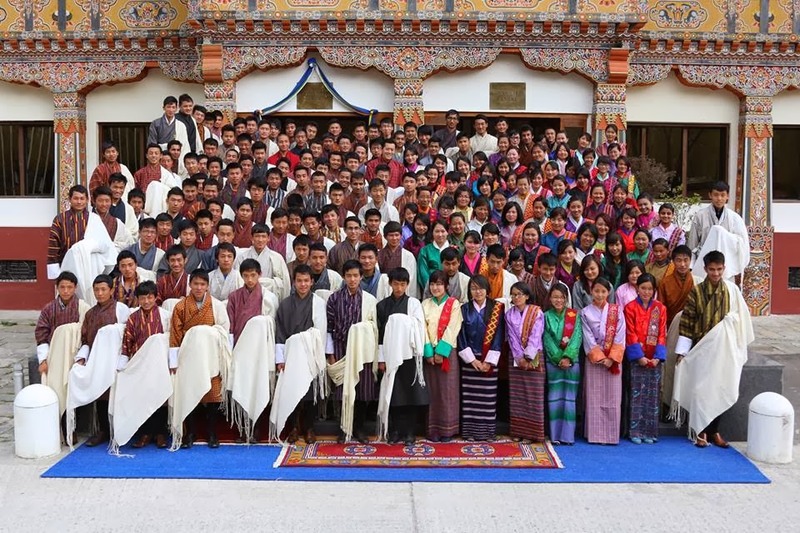 It is around one during the midday when one hundred and seventy two scholarship students gather in front of the Banquet Hall, Thimphu. His Majesty’s Zimpoen teaches us the discipline to show and behaviour to behave in front of His Majesty. My heart is yearning for the King and my eyes, eagerly waiting to have glance on the Queen. I know my friends have the same feelings of mine, of heart and eyes. After some arrangements of rows and columns among ourselves, we march to the door, guards check us thoroughly and then only let us, inside the hall. Wow! The hall is heaven, decorated in cultural greenery, perfect and peace. The columns of tables lay straight as ruler and thousand chairs occupy their respective tables. Picturesque and statuesque flowers surround us; various dishes stand still on each table eagerly waiting for somebody hungry like us. There are muscular cultured servers waiting for us to get settled. We sink on our own chairs very carefully and silently. Silence fills the room that gives way to complete peace. Once again the Zimpoen and other officials teach us to present ourselves to the King. I can see their minds filled with apprehension about the way we would be in coming few hours. We learn and do run-through for several minutes. I can see some of my friends doing majestically while others dissolve themselves into silent laughter by looking at each others’ show. Practicing it for little longer minutes, we get back to our seats. Silence remains for some seconds, silence for some minutes, and half an hour passes. No sign of HM’s arrival. But we aren't ready to give up. We promise to wait eagerly. I close my eyes and silence makes me feel that I am only the one. Silence signifies peace and the source of peace is the king and silence will be replaced by the king. Finally, the king arrives accompany by the queen. We stand up at once and bow in unison dedicating ourselves for the nation, promising with full trustworthiness and the best commitments. We get back to the seats by lowering our heads and raising our full attention for HM’s wisdom. We are fortunate to feel HM’s words of greatness. His Majesty’s friendly wisdom is really inspiring and inspiriting; First we must study and should be able to stand on our own feet, because it is beautiful truth that we cannot help others first by helping ourselves. Only after that we must look after our parents and neighbors. Addition to this it is mandatory to contribute for the well being of the nation. We must constantly be determined to move forward though the obstacles may stop us and hardships may disturb us. Disciplinary greenery is important as academic greenery. We must always have the heart of benevolence and constant mind to accept hardships and risks to move forward for the best betterment of one and all. We are only the one who can judge ourselves and yield magnificent fruition. Know yourself and know others, help those who are in really need of help. After His Majesty’s speech we have snacks and tea. We enjoy with the king talking friendly with him and cracking jokes in between the conversation to fill the gaps. As a sign of appreciation and encouragement His Majesty presented us with the prized gift of ngultrum 1000/- each and fortunately I got 2000/-, so asking to myself, I gave it back to one one who missed his share. I believe this is always something best in stored for me. Then we have the photo session. Smiling and cheering faces give way to the cameras. My thought for the day; Experiencing Royal Audience has planted seeds of hopes and saplings of determination in my fertile heart. I promise with my commitments to let these seeds and saplings grow and yield magnificent results for one and all.